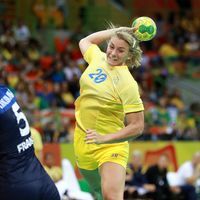 The race for the handball gold medals is getting hotter at the 2016 Olympic Games in Rio with the women's quarter-finals scheduled for Tuesday and the men's quarter-finals happening on Wednesday. Among the sixteen teams left in the competition across the two events, there are twelve from Europe - six each in the women's and the men's competition. Russia's women are the only squad that won all five games in the preliminary round. They will face Angola in the last quarter-final on Tuesday (1:30 hrs CET). First up at the Future Arena are Brazil and Netherlands (15:00 CET). The Brazilian 2013 world champions came first in Group A, winning four from five matches, while the Netherlands, silver medallists at the World Championship 2015, came fourth in Group B. The two remaining matches are all-European affairs. Defending champions Norway take on Sweden (22:00 CET), while Spain, silver medallists at the EHF EURO 2014, face France (18:30 CET). In the men's event, EHF EURO champions Germany came first in Group B to face Qatar in the quarter-finals. It is a chance for Germany to take revenge after they lost the quarter-final at the World Championship 2015 26:24 to Qatar. The match starts at 18:30 hrs CET on Wednesday. Just like in women's event Brazil open the quarter-final day when they take on defending champions France at 15:00 hrs CET. France came second in Group A with four wins from five matches, while Brazil finished third with five points. Denmark against Slovenia at 22:00 hrs CET and Croatia vs Poland at 1:30 hrs CET on Thursday morning complete the quarter-final schedule for the men's event. The semi-finals take place on 18 (women's event) and 19 August, the women's final on 20 August, the men's final on 21 August.